In this quickstart, you will use Intune to create a group based on an existing user. Groups are used to manage your users and control your employees' access to your company resources. These resources can be part of your company's intranet or can be external resources, such as SharePoint sites, SaaS apps, or web apps. Intune provides pre-created All Users and All Devices groups in the console with built-in optimizations for your convenience. To complete this quickstart, you must create a user. Sign in to the Intune portal as a Global administrator or an Intune Service administrator. If you have created an Intune Trial subscription, the account you created the subscription with is the Global administrator. Once you've opened the Microsoft Intune pane, select Groups > New group. In the Group type dropdown box, select Security. In the Group name field, enter the name for the new group (for example, Contoso Testers). Add a Description for the group. Set the Membership type to Assigned. Click Members and select one or more members for the group from the list. Once you have successfully created the group, it will appear in the list of All groups. In this quickstart, you used Intune to create a group based on an existing user. 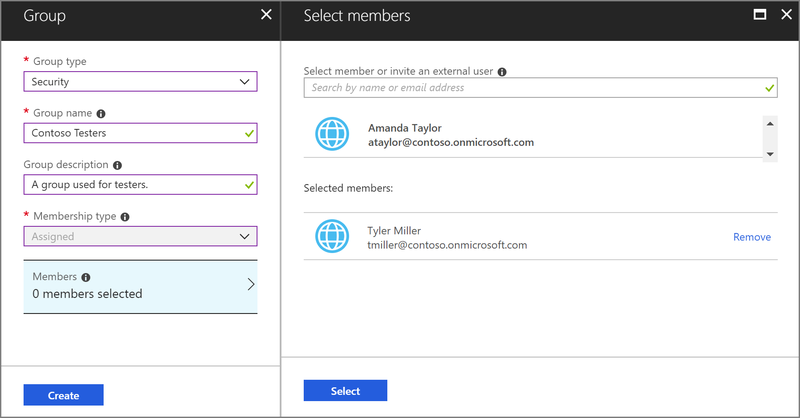 For more information about adding groups to Intune, see Add groups to organize users and devices.